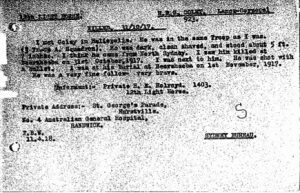 Harry “Rex” George Coley was born on the 10th of July 1895 in Handsworth, Staffordshire to jeweller Harry Coley and Frances Maria Coley nee de Fallon. 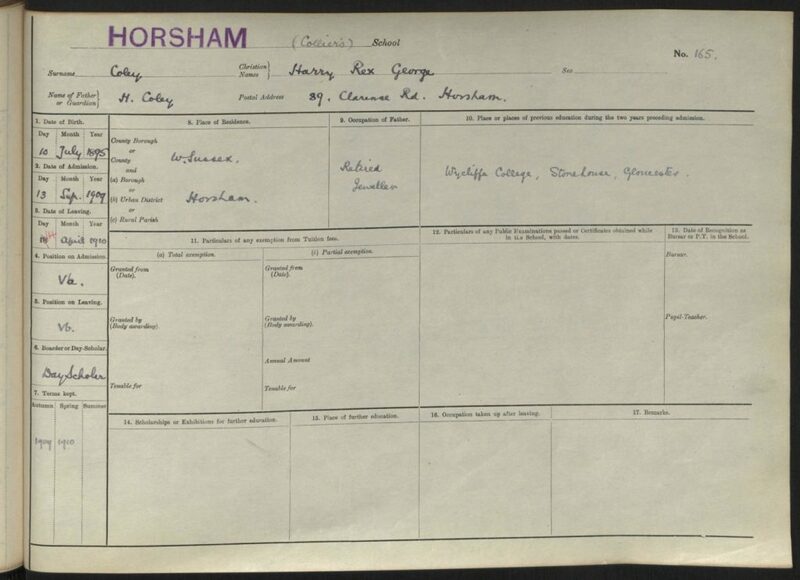 Harry Rex George had three siblings of whom two are known: Dorothy Coley born about 1890 in Aston, Warwickshire and Carl Leslie Coley born about 1897 in Handsworth, Staffordshire. 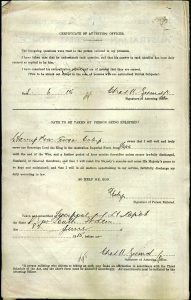 At the time of the 1901 Census, the family lived at 15 Wellington Road, Handsworth, Staffordshire. 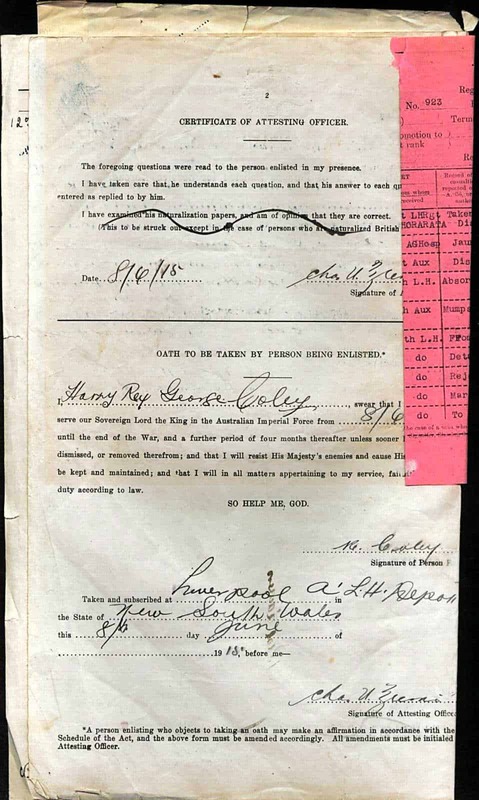 Harry senior was working as a gold ring maker and Frances was at home. 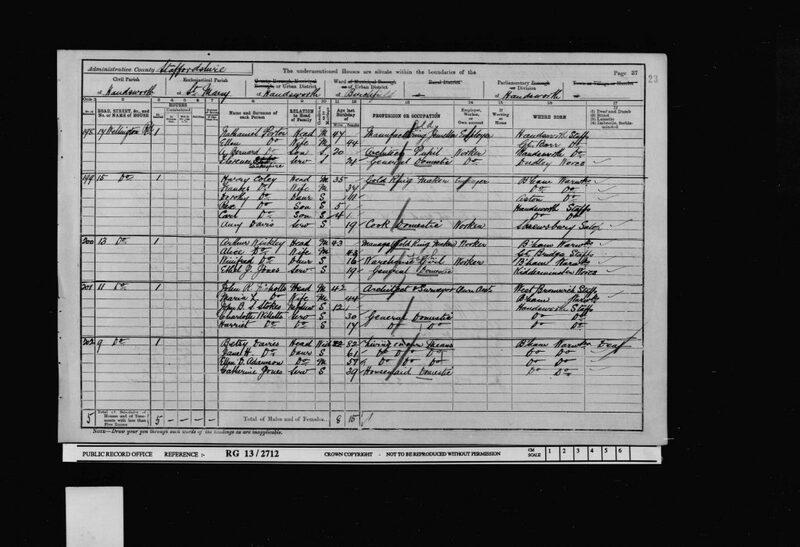 The household further comprised of their children: Dorothy, Harry and Carl. 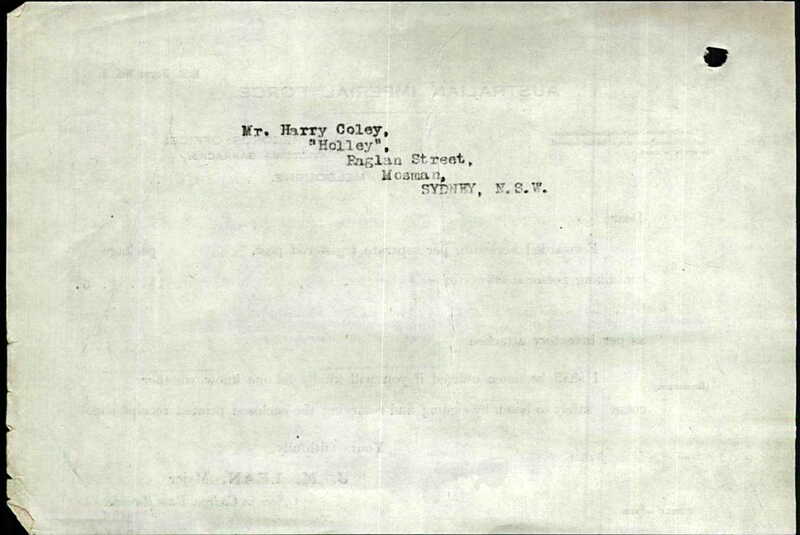 The family also employed a cook. 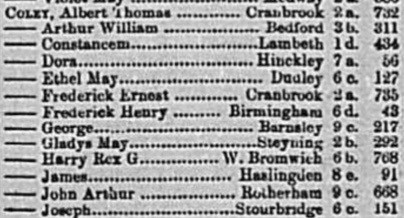 Harry attended Wycliffe College School House, Gloucestershire. 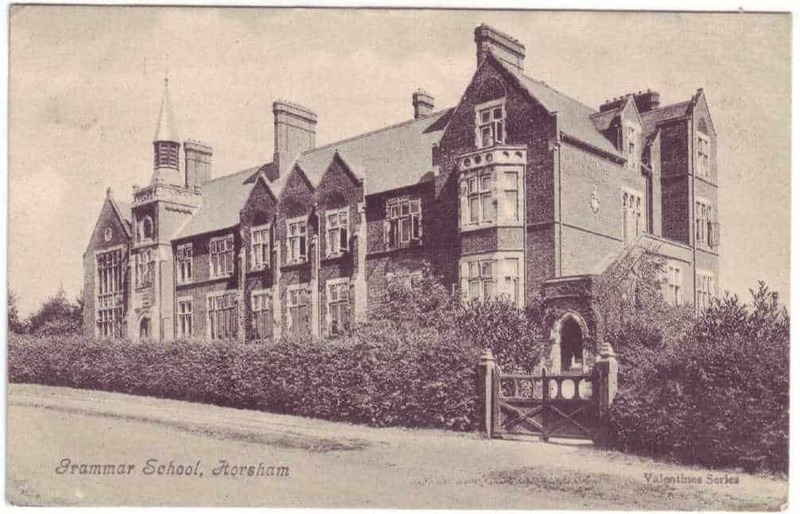 Later, on the 13th of September 1909 he was admitted into Collyer’s Grammar School in Horsham. 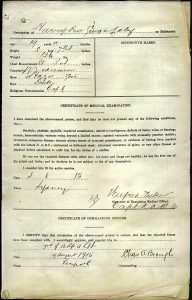 At the time of his admission the family lived at 39 Clarence Road in Horsham. 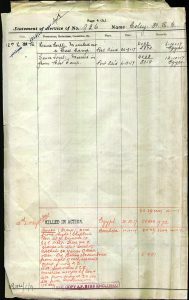 He left the school on the 4th of April 1910. 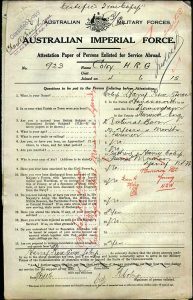 Harry’s father Harry travelled from Southampton on board the SMS Friedrich Der Grosse to Sydney, Australia, arriving on the 13th of December 1909. 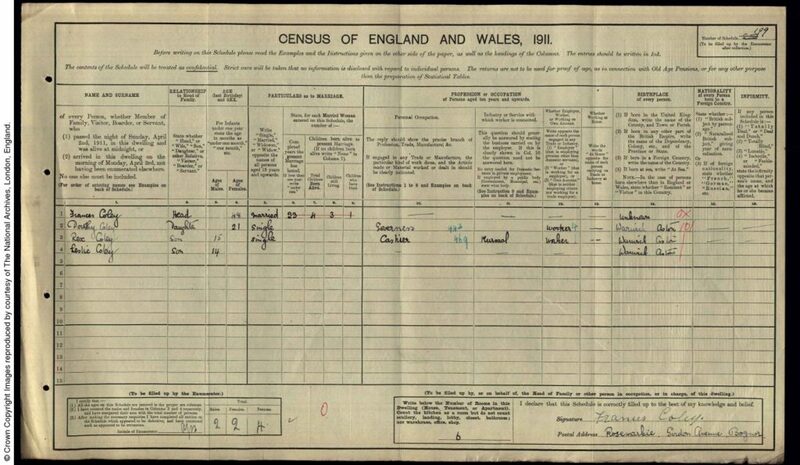 At the time of the 1911 Census, Frances and her children Dorothy, Harry and Carl lived at [Rosemarkie? 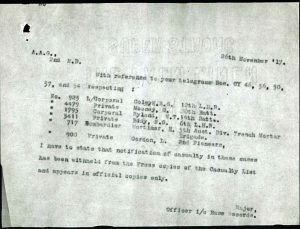 ], Gordon Avenue, Bognor, Sussex. 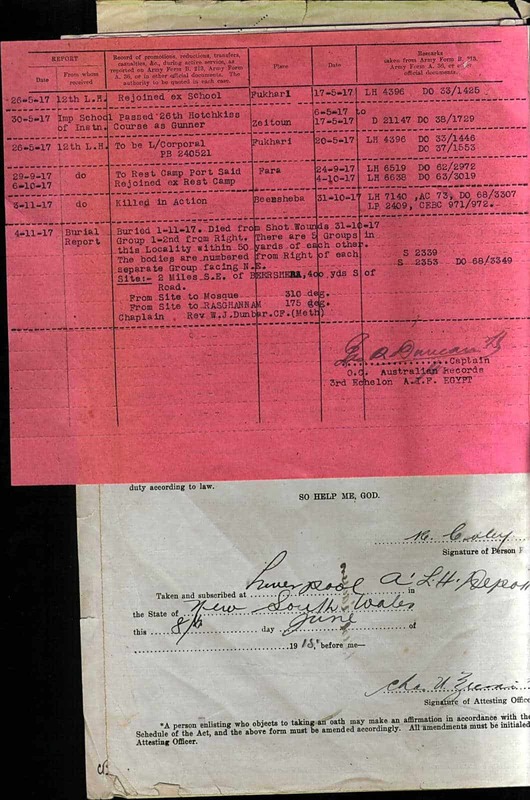 Dorothy was working as a governess and Harry was a cashier. 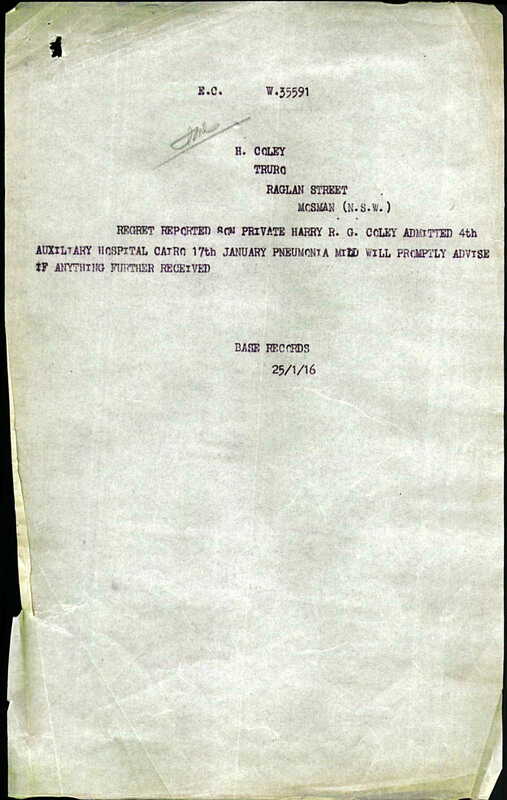 Frances stated that she had given birth to four children of whom three were still alive. 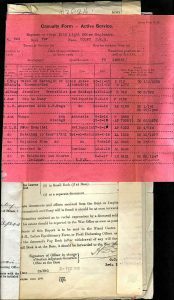 The house had six rooms. 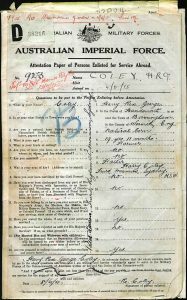 Harry Rex George Coley travelled from London on board of Rangatira to Sydney, New South Wales, Australia, arriving on the 20th of March 1913. 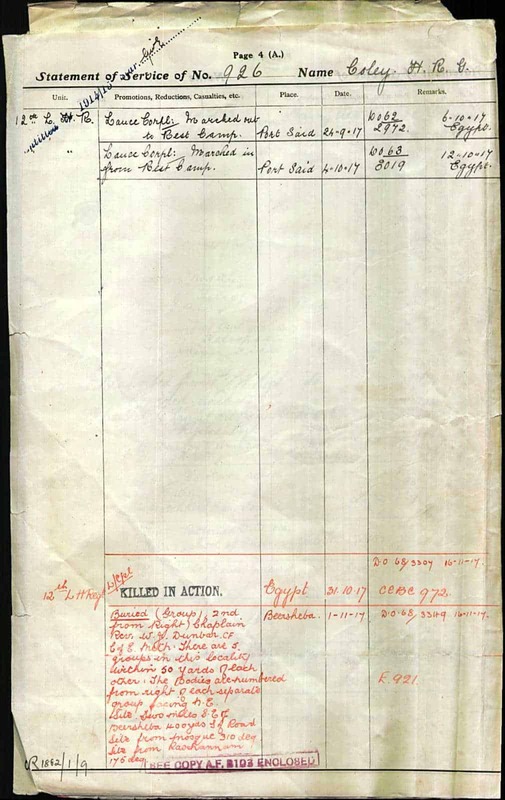 Harry’s mother Frances was buried on the 19th of June 1915 at St Mary’s church in Reigate. 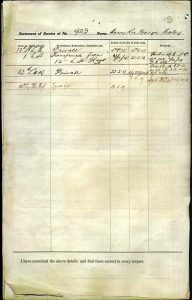 At the time of her death she lived at the Cottage, Glovers Farm, Reigate. 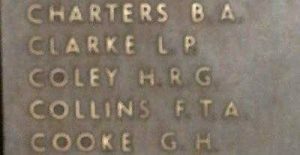 She was 57 years old. In Australia, Harry studied for a year at an agricultural college in New South Wales. 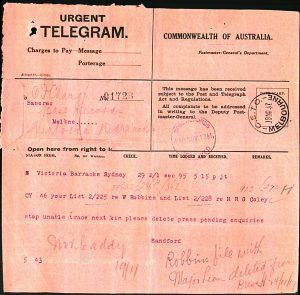 When the war broke out, Rex, who was about to become a partner in an isolated farming estate in Narromine, went to Sydney to enlist. 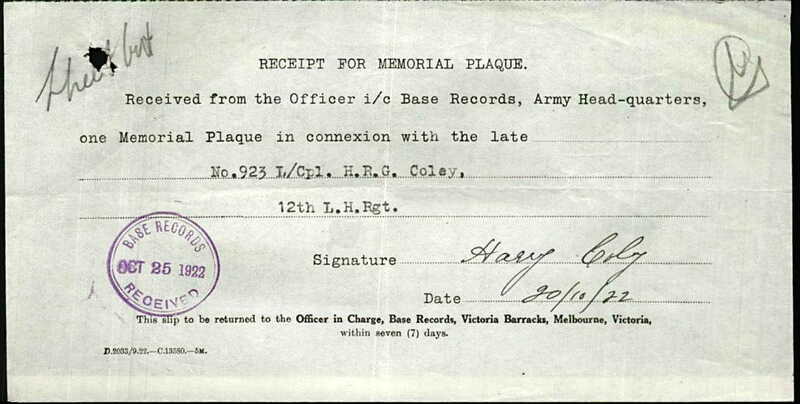 Harry; now known as Rex; enlisted on the 4th of June 1915 in Liverpool, New South Wales into the Australian Imperial Force. 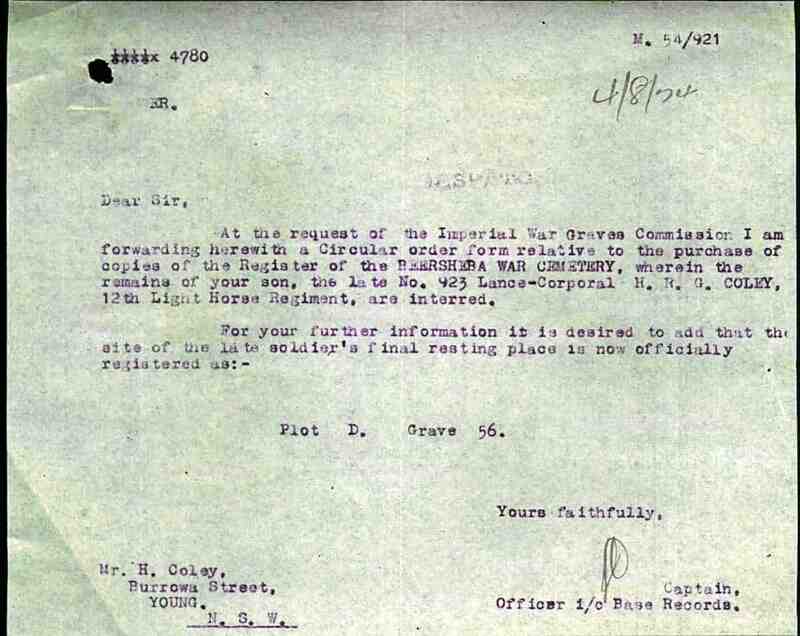 He was a Private with regimental number 923. 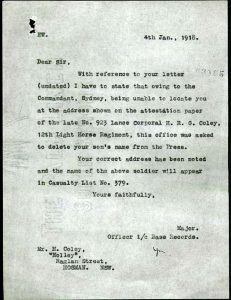 At the time of his enlistment he was a farmer and lived with his father at “Truro”, Raglan Street, Mosman, Sydney, New South Wales. 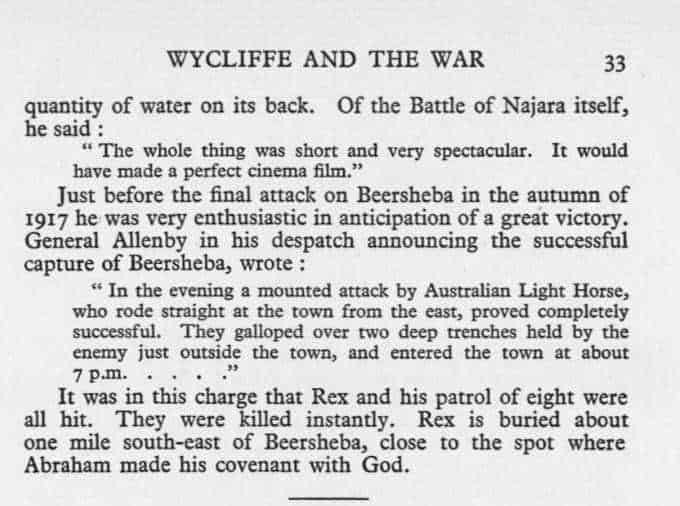 His father was also Rex’s next of kin. 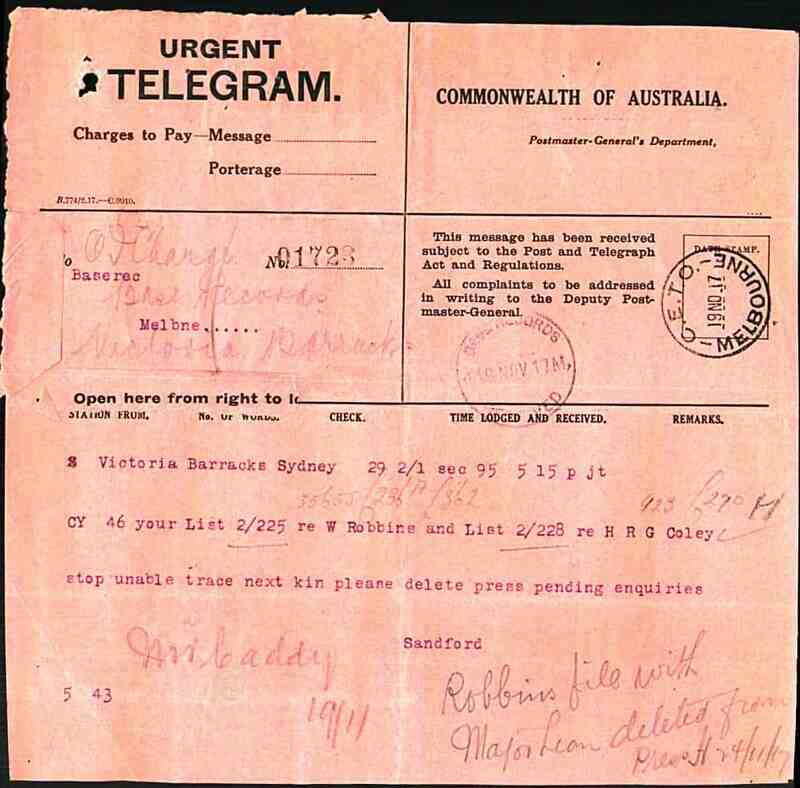 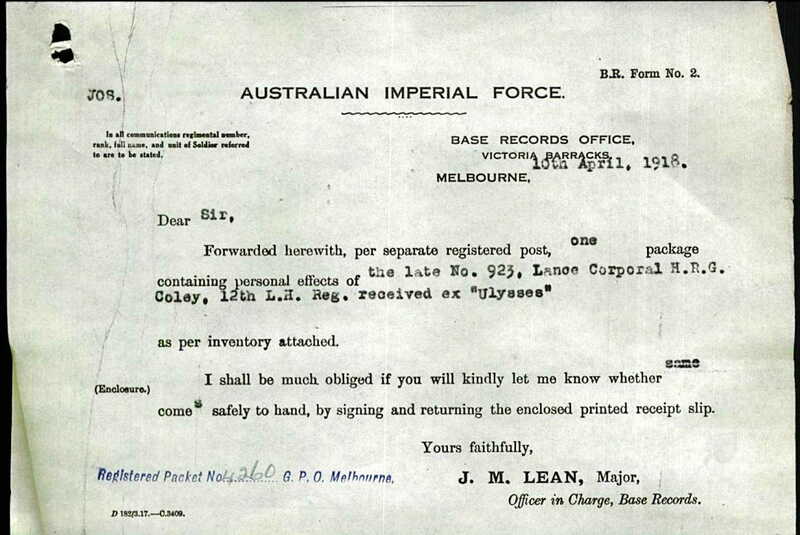 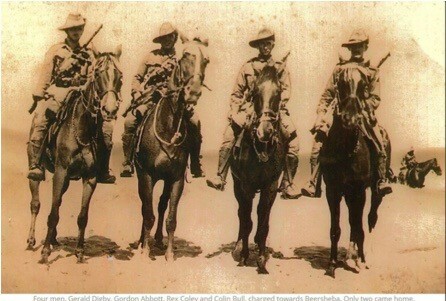 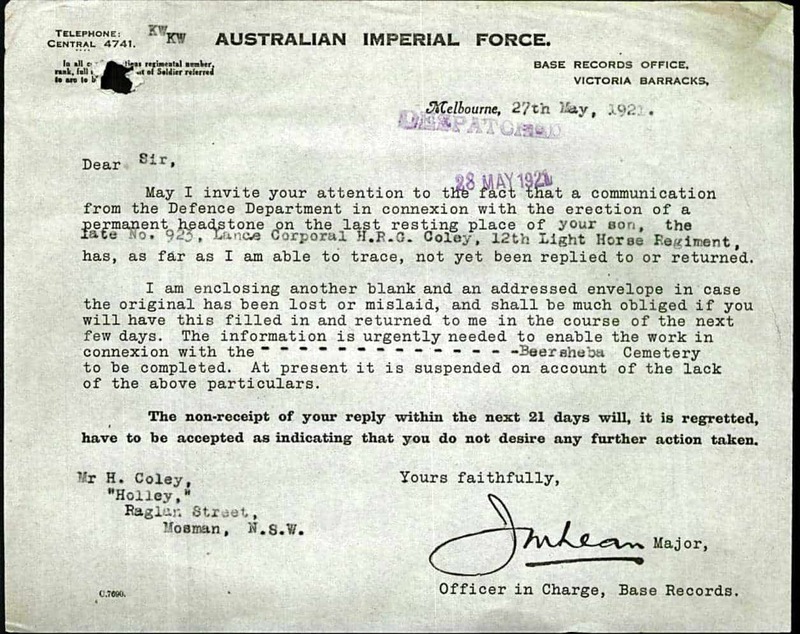 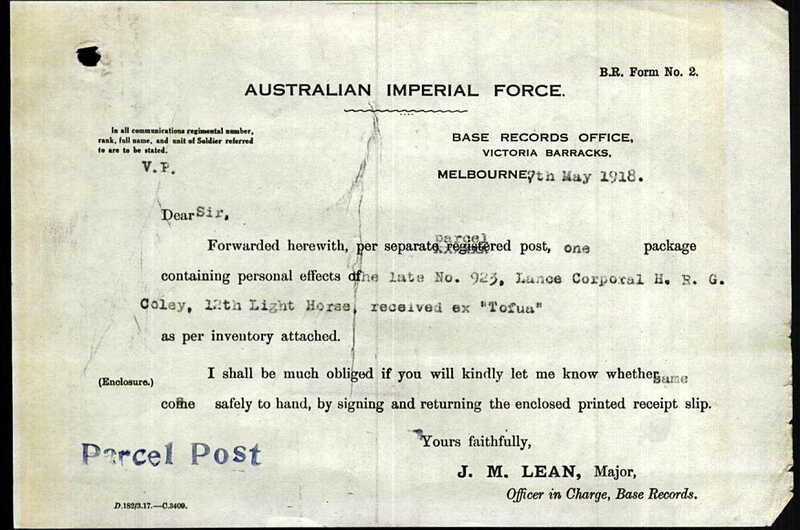 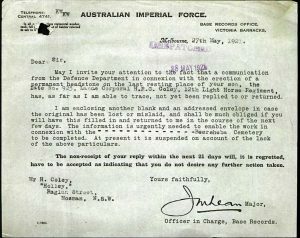 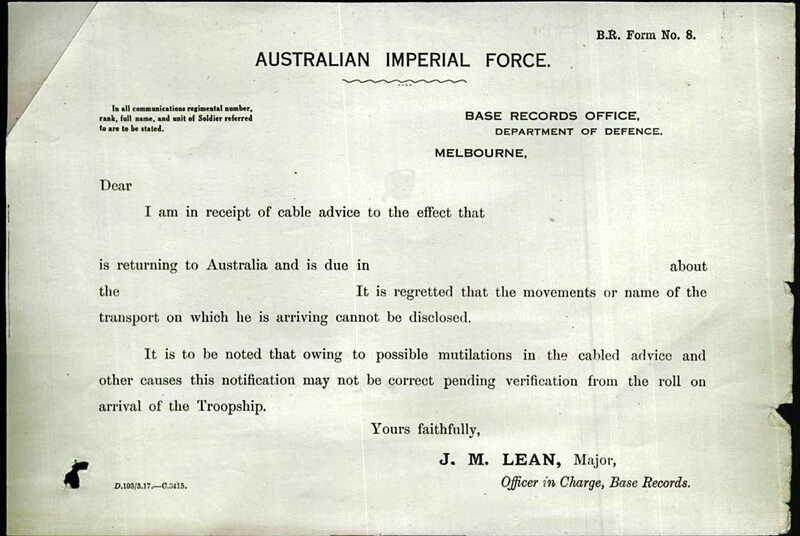 From the 9th of June 1915 Rex was part of the 12th Australian Light Horse Regiment. 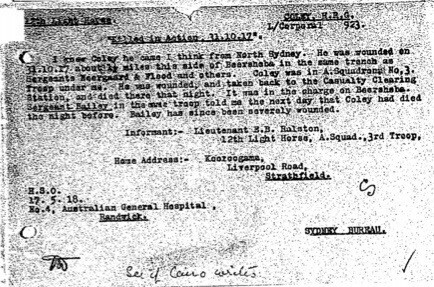 The regiment trained at Holsworthy Camp in Liverpool, New South Wales. 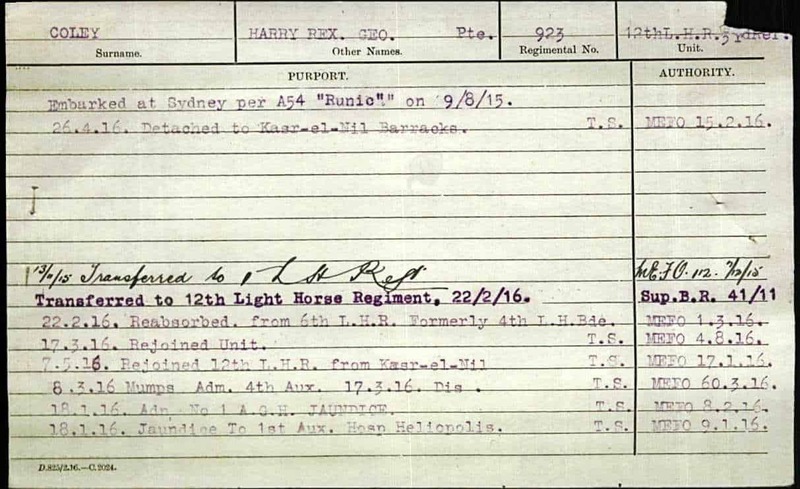 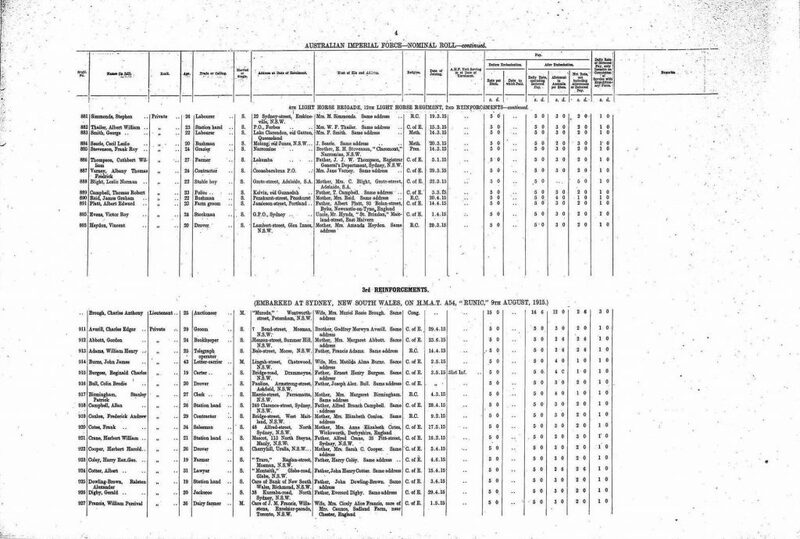 Rex embarked on the 9th of August 1915 on board of HMAT A54 Runic from Sydney, New South Wales to Heliopolis, Egypt. 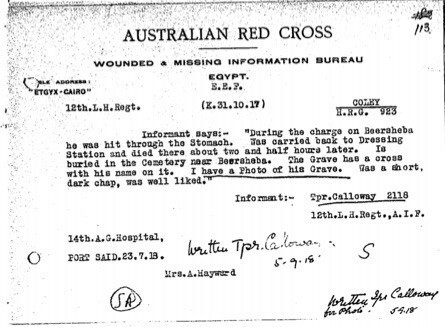 After a few weeks at Heliopolis he landed at Gallipoli and remained there until the evacuation in December 1915. 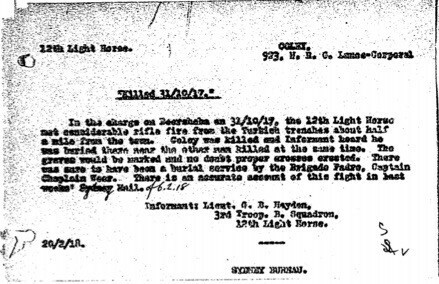 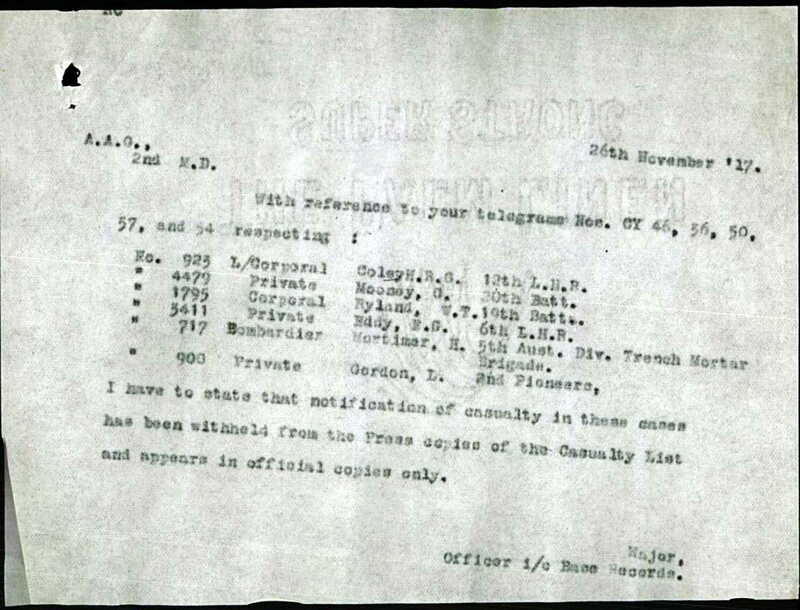 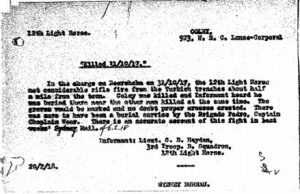 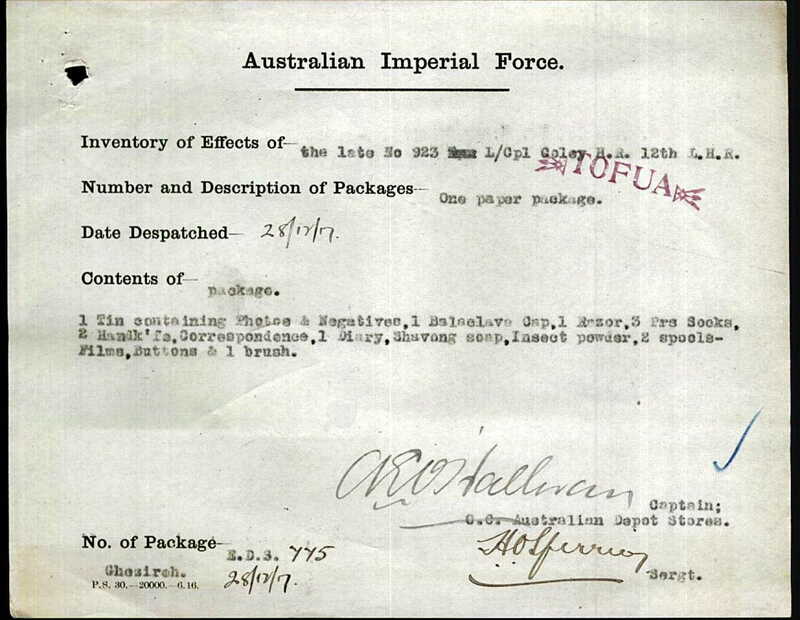 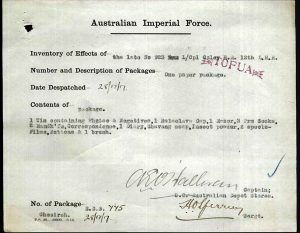 On the 13th of November 1915 in Gallipoli he was transferred into the 1st Light Horse Regiment. 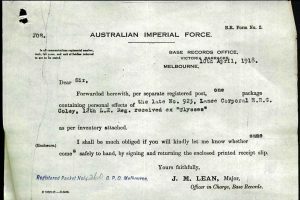 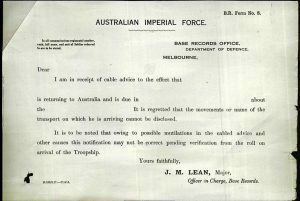 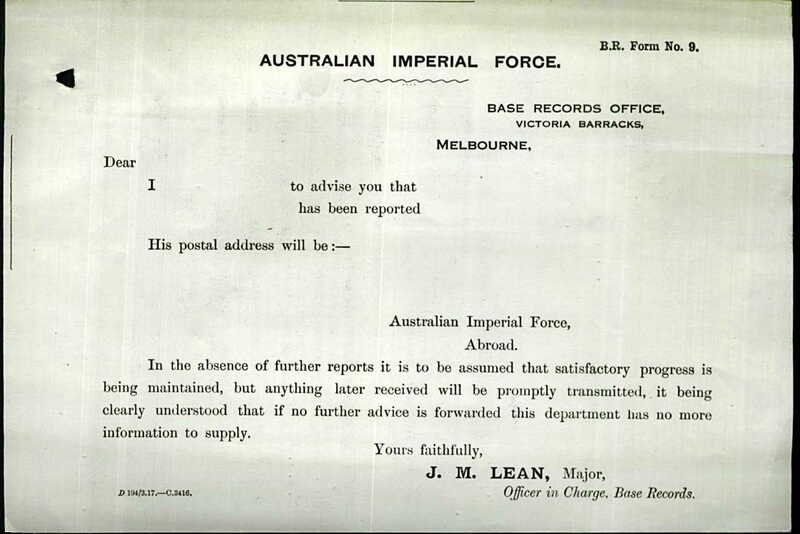 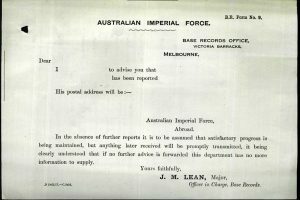 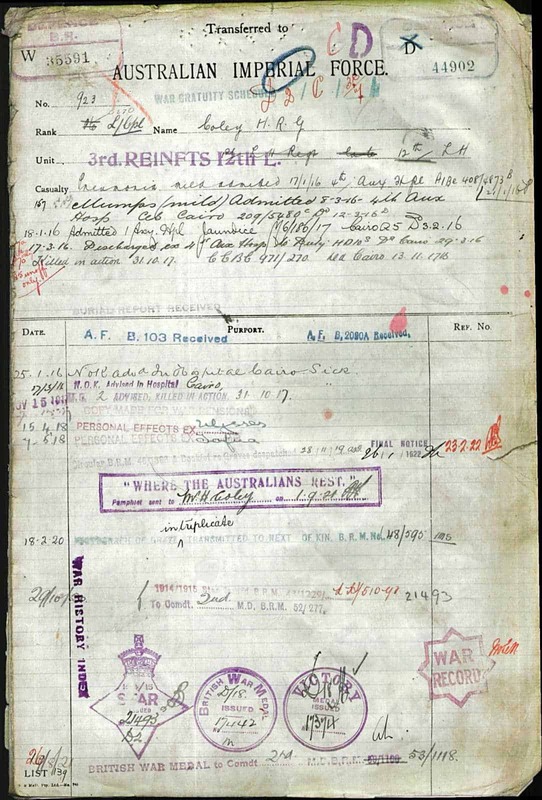 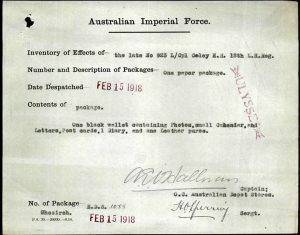 On the 11th of January 1916 Rex disembarked in Alexandria, Egypt. 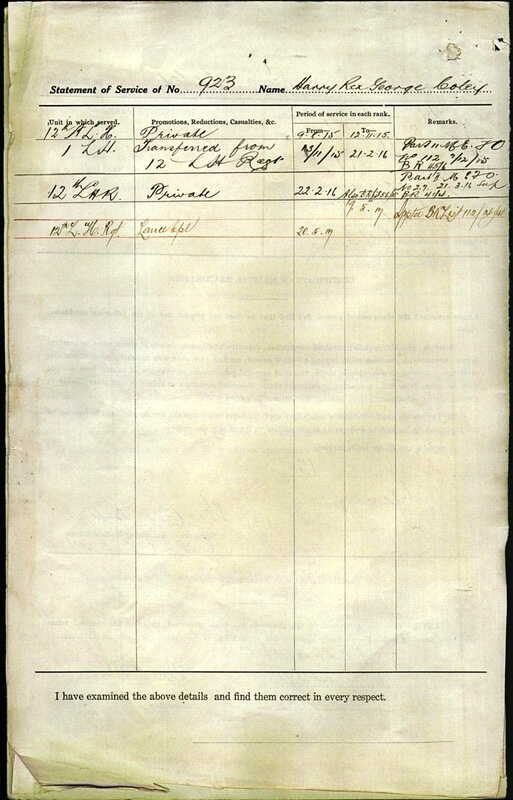 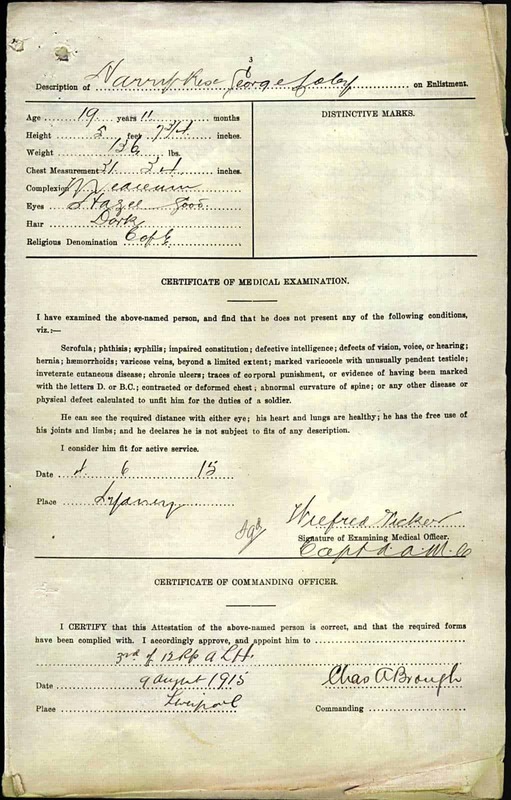 On the 18th of January 1916 he suffered from jaundice and was admitted into the No. 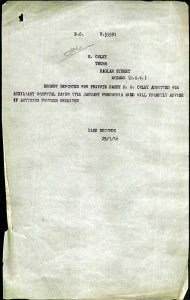 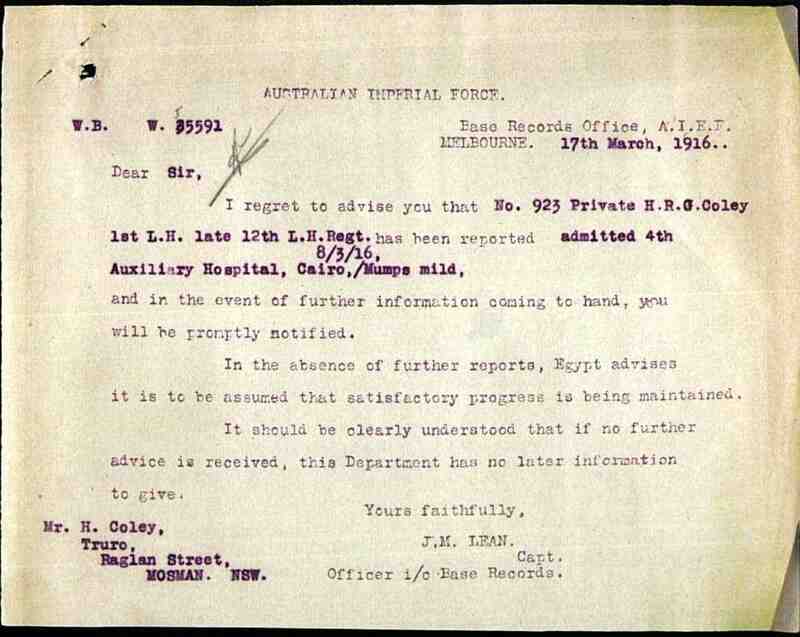 1 Australian Auxiliary Hospital in Egypt. 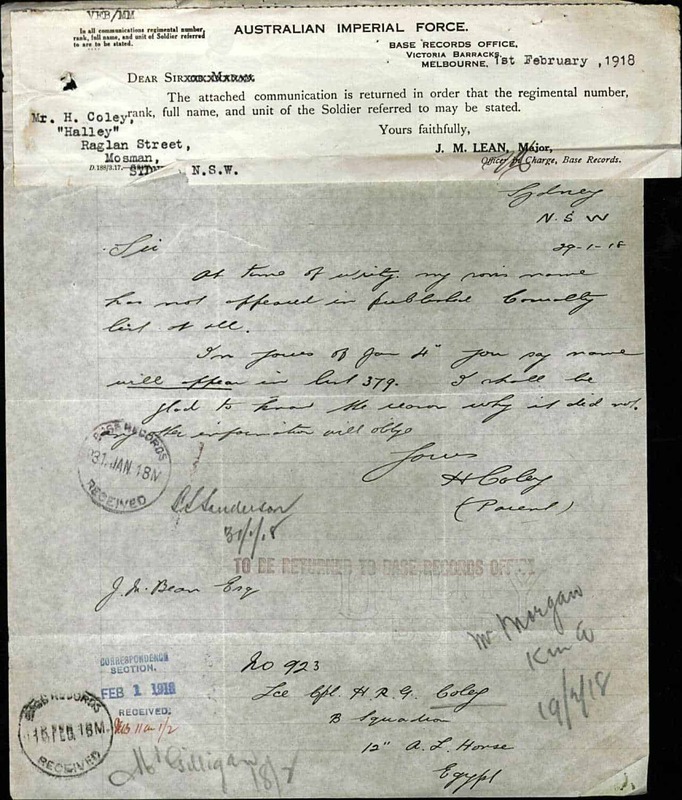 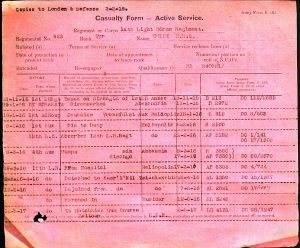 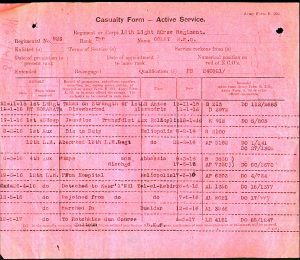 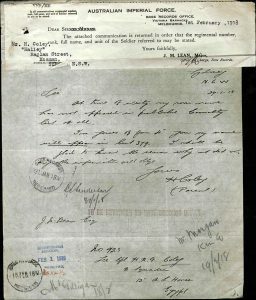 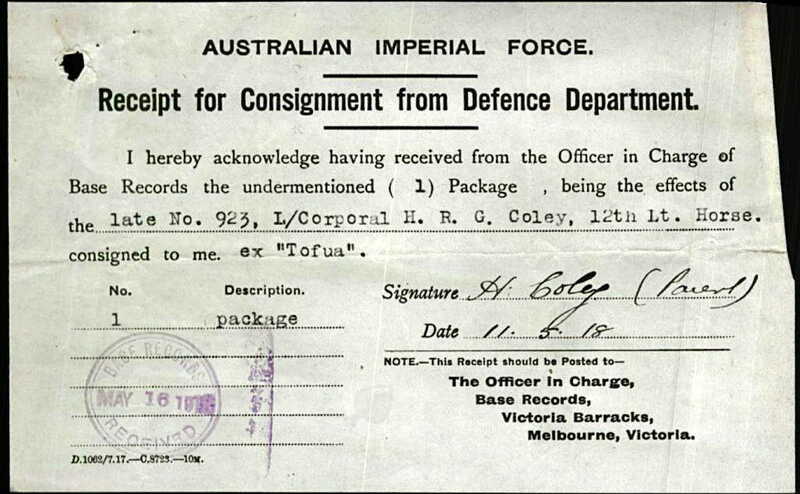 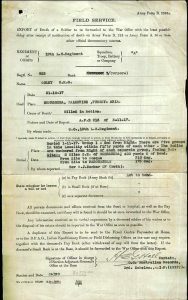 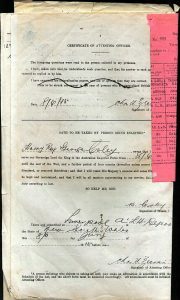 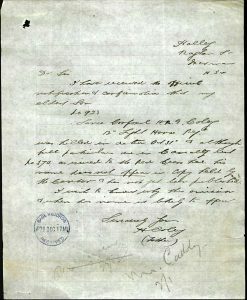 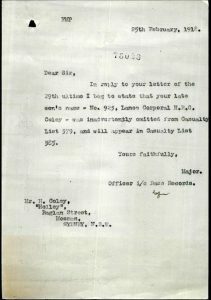 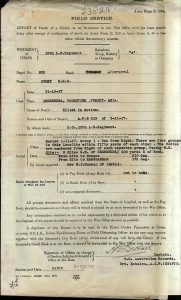 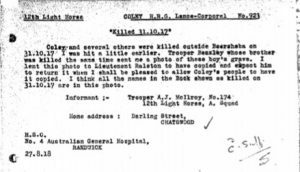 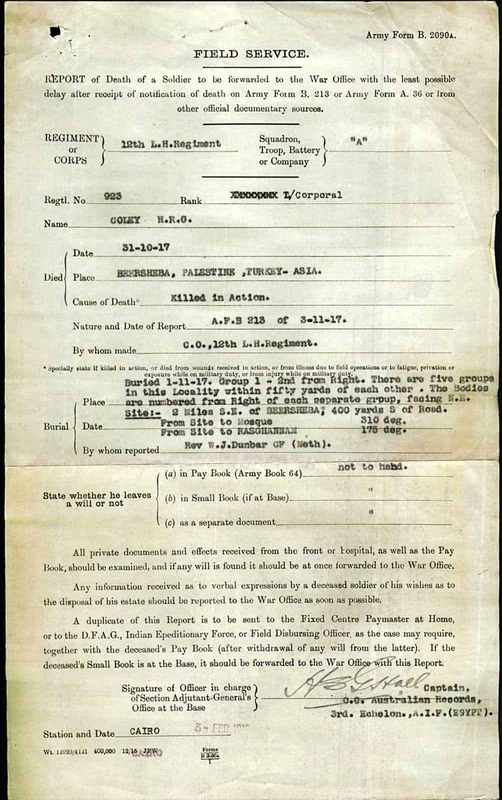 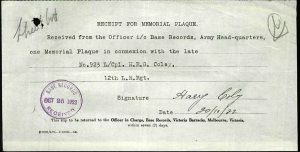 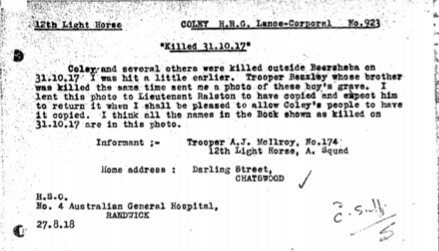 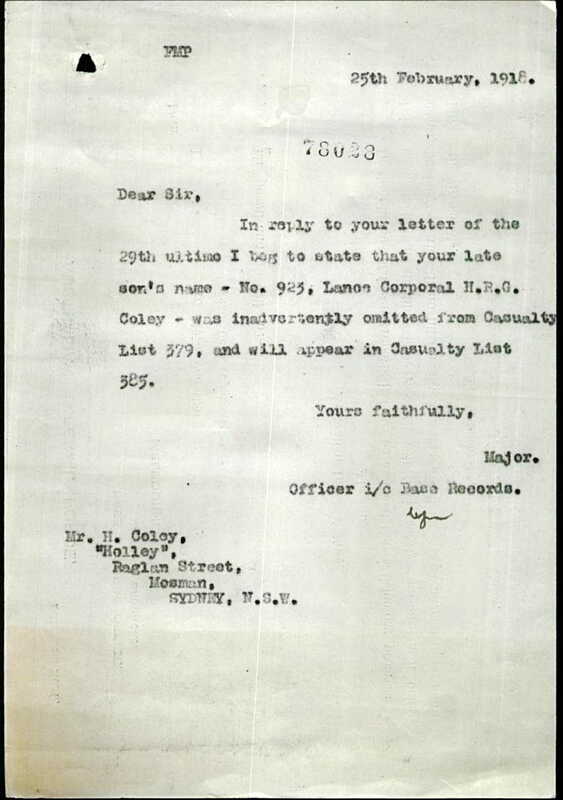 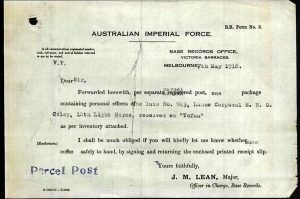 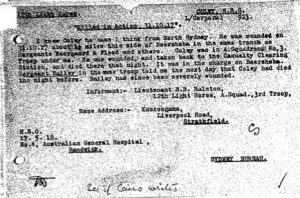 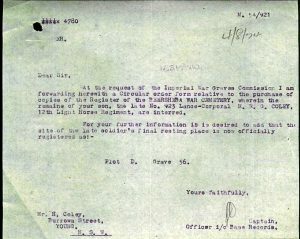 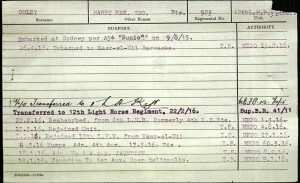 On the 22nd of February 1916 Pte Coley was transferred into the 12th Light Horse Regiment. 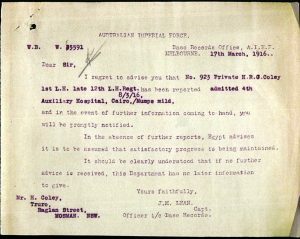 On the 8th of March 1916 Rex suffered from light mumps and was admitted into the 4th Auxiliary Hospital in Abbassia, Cairo, Egypt. 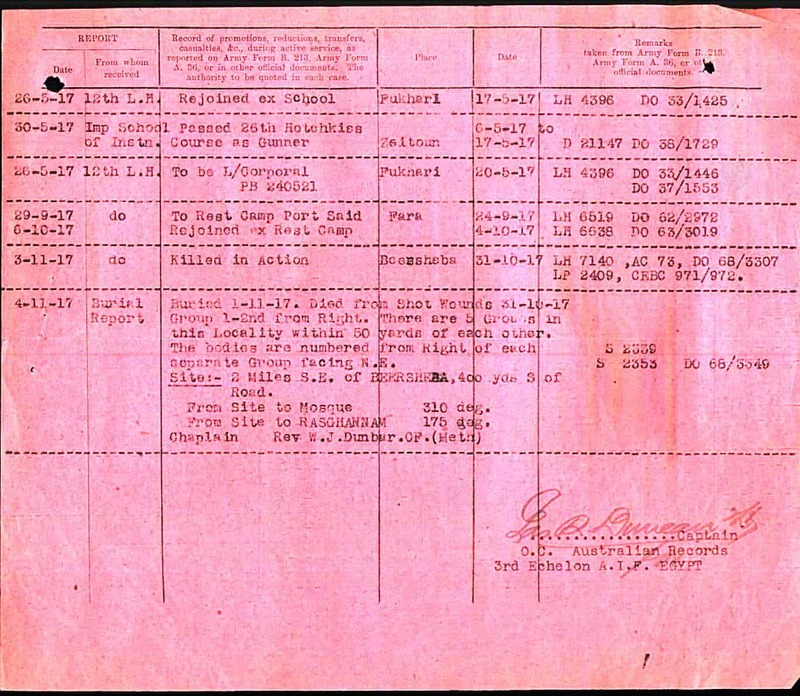 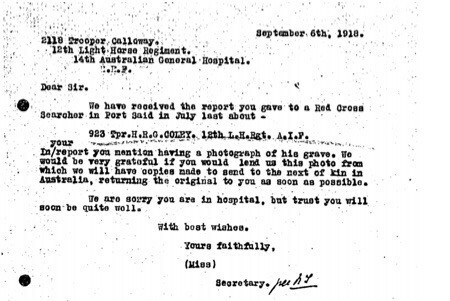 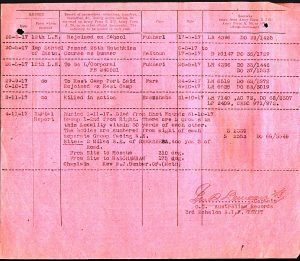 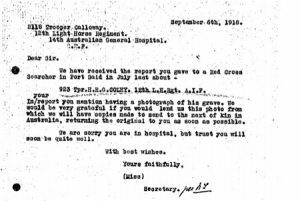 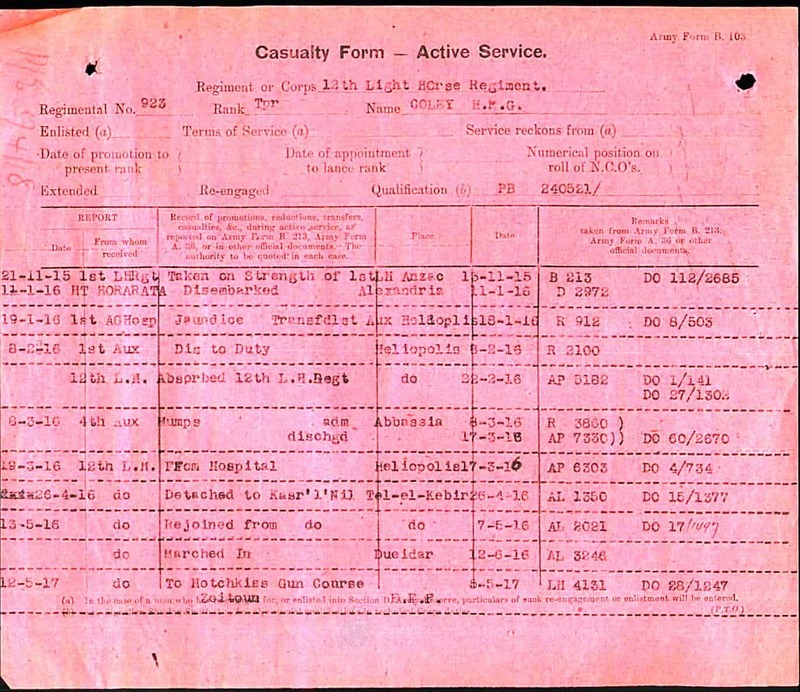 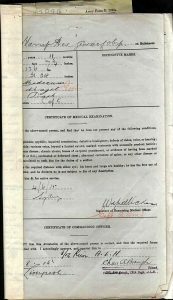 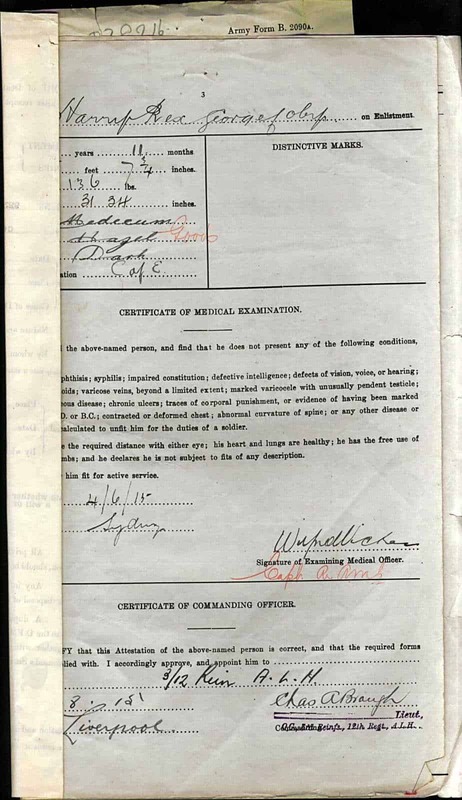 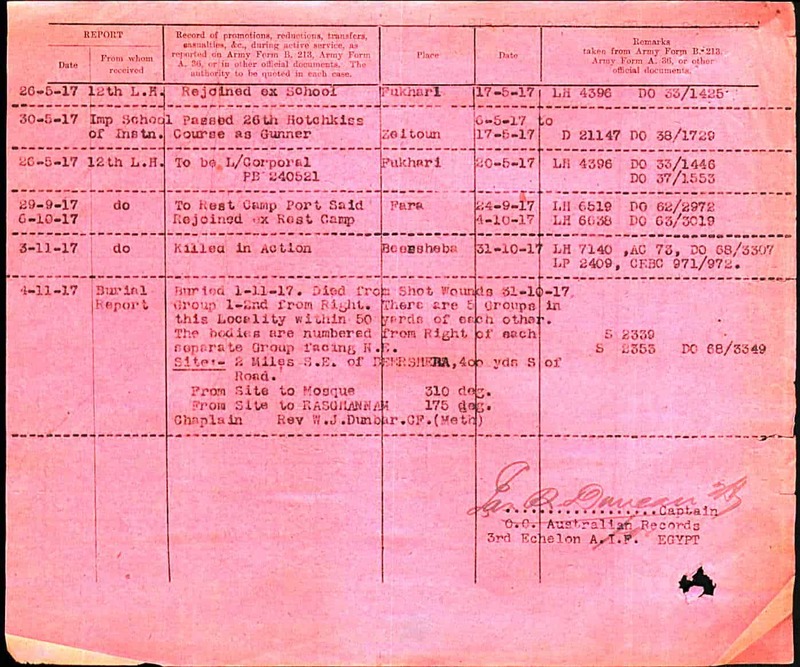 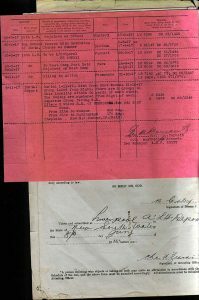 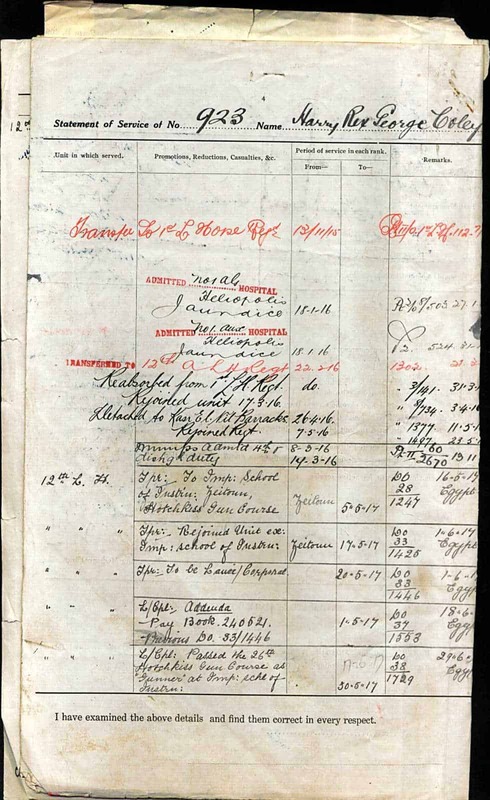 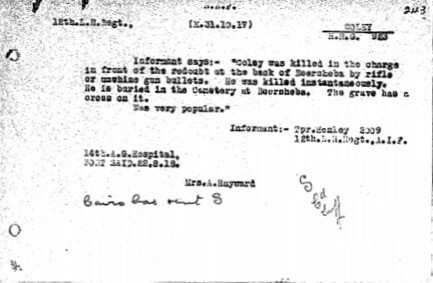 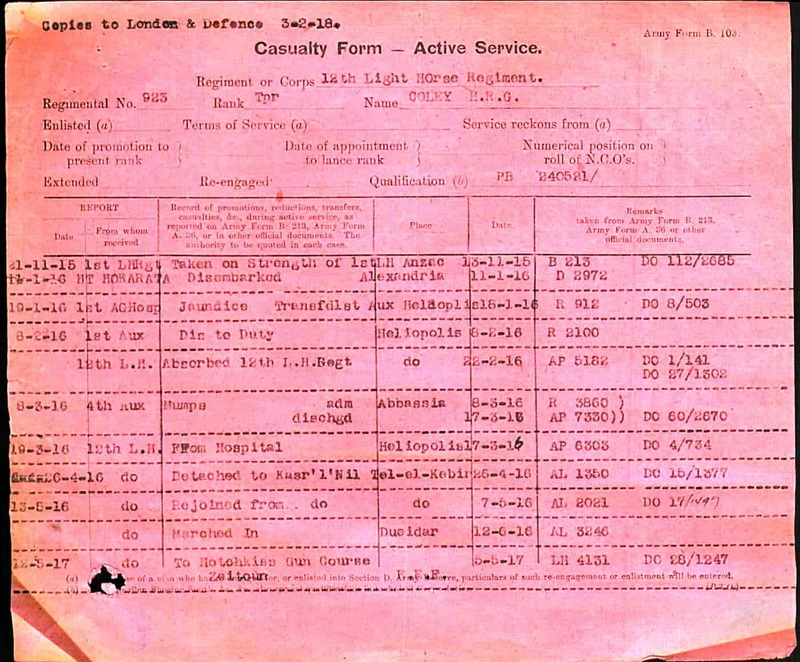 He left the hospital on the 17th of March 1916. 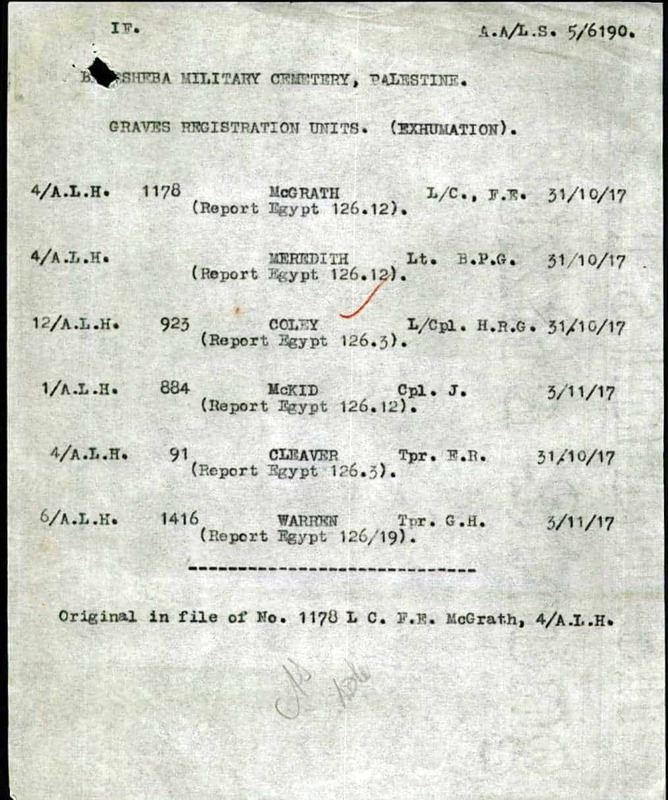 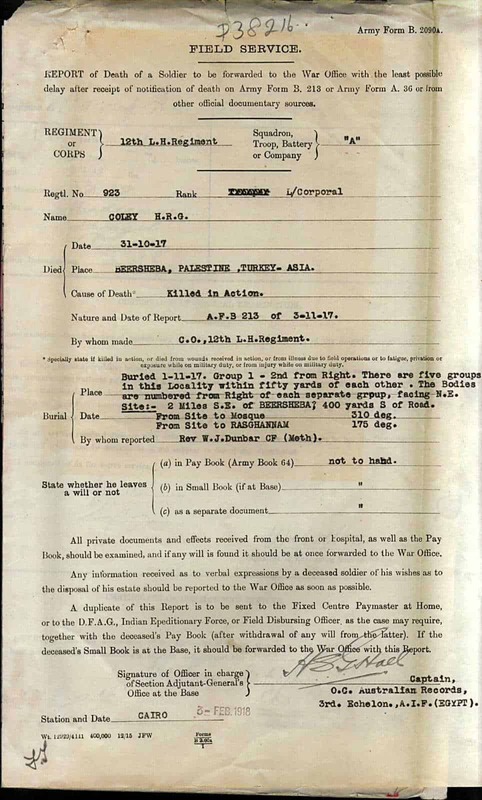 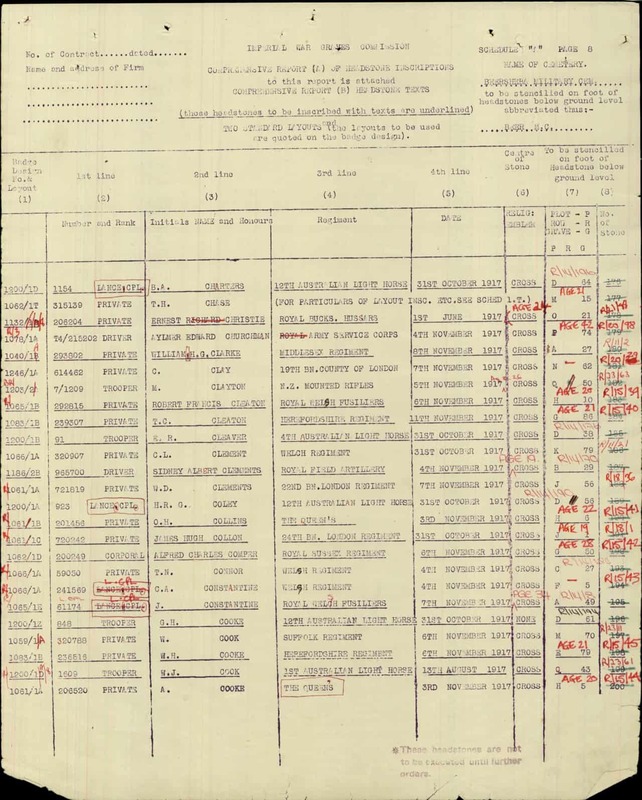 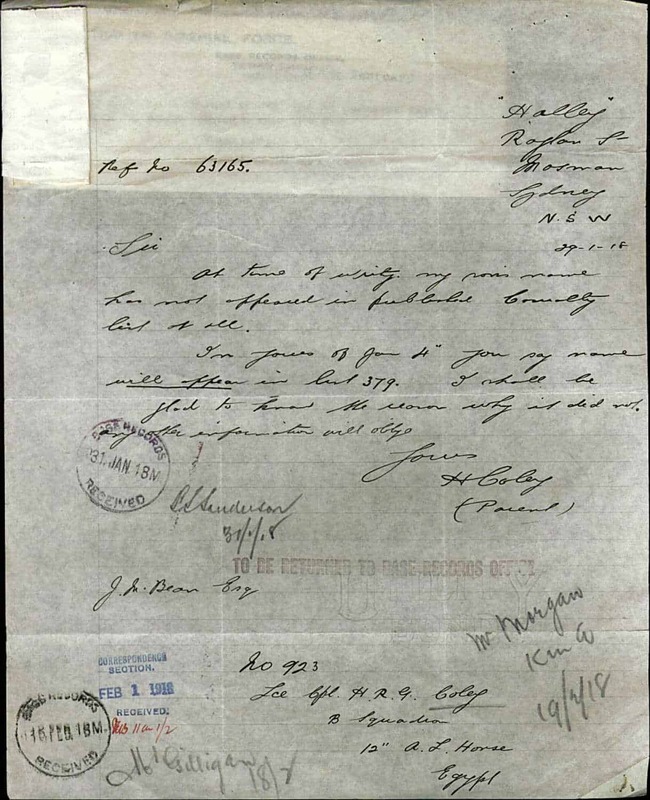 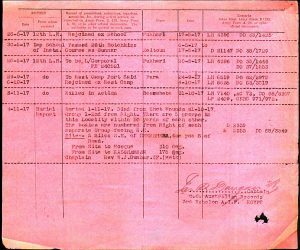 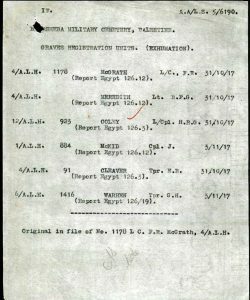 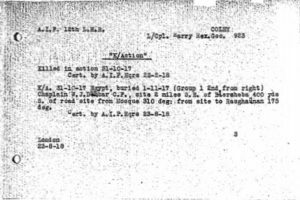 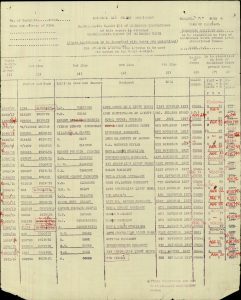 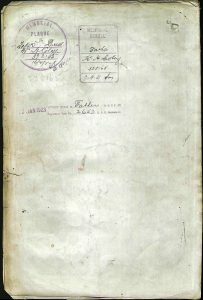 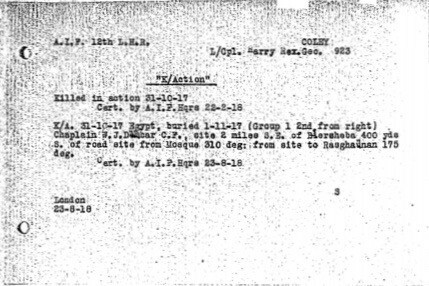 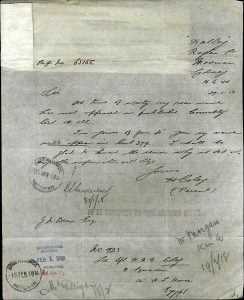 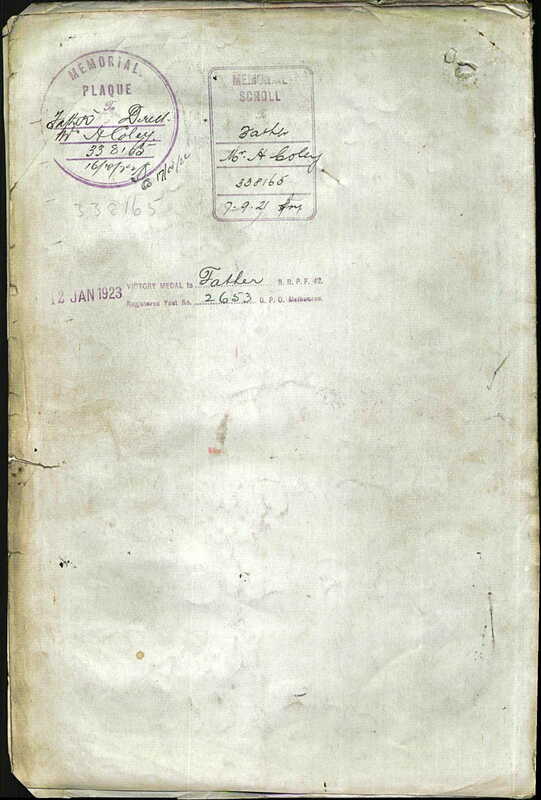 He was detached to Kasr’l’Nil Barracks, Cairo on the 26th of April 1916 and re-joined his unit on the 7th of May 1916. 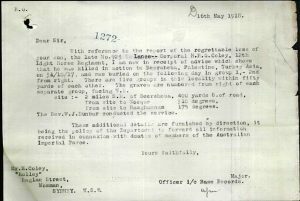 On the 5th of May 1917 Pte Coley entered the Hotchkiss Gun Course at the Imperial School of Instruction in Zeitoun near Cairo. 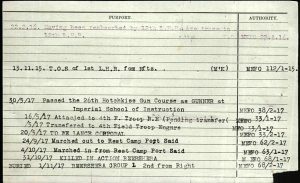 He passed the 26th Hotchkiss Gun Course as a gunner. 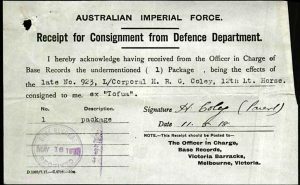 He re-joined the 12th Light Horse Regiment on the 17th of May 1917 in Fukhari, Palestine where he became a Lance Corporal on the 20th of May 1917. 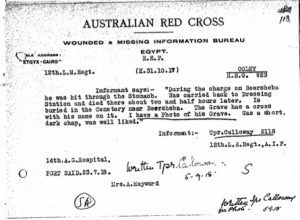 On the 24th of September 1917 he marched out to Rest Camp, Port Said in El Fara, Palestine and re-joined his unit on the 4th of October 1917. 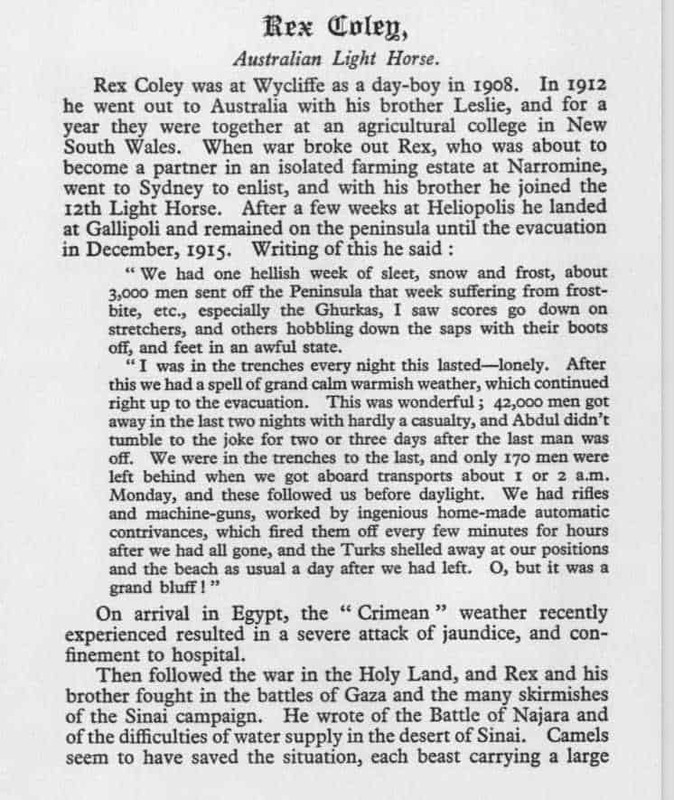 Lance Corporal Coley fought in the battles of Gaza and many skirmishes of the Sinai Campaign. 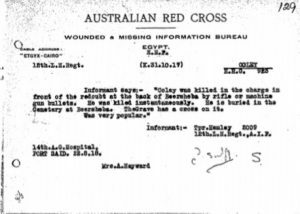 He was killed during the charge on Beersheba, Palestine/Turkey on the 31st of October 1917. 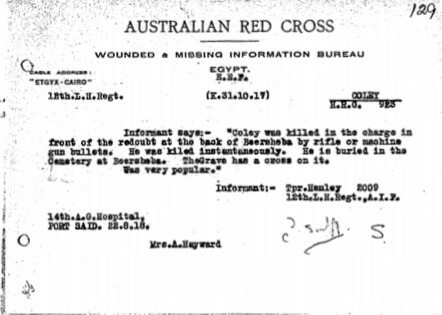 Coley and several others were shot outside Beersheba. 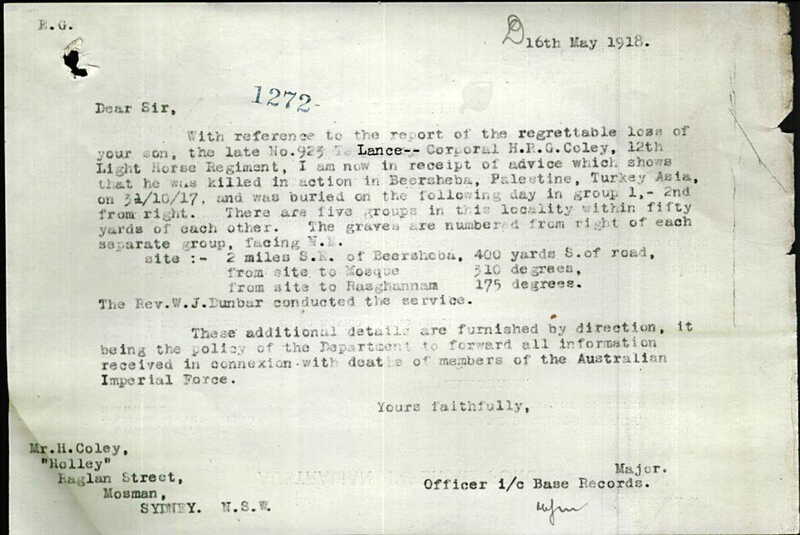 He is buried at the Beersheba Military Cemetery in Palestine/Turkey (now Israel and Palestine -including Gaza). 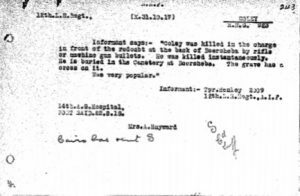 His grave reference number is D.56. 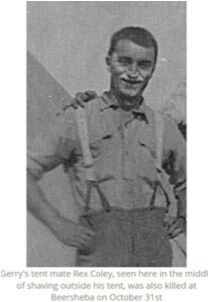 Harry Rex George was short, had a medium complexion, dark hair and hazel eyes. 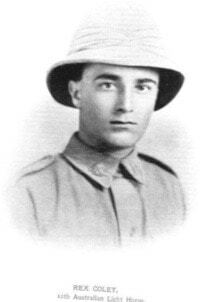 He was always clean shaven and very popular. 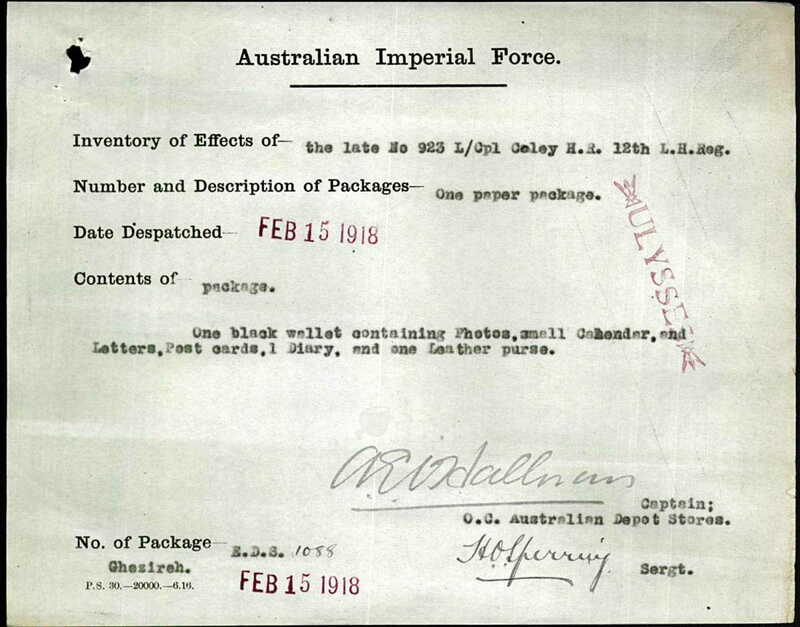 In 1917 Rex’s father Harry received his personal effects including: 1 tin containing photos & negatives, 1 balaclava cap, 1 razor, 3 pair of socks, 2 handkerchiefs, correspondence, 1 diary, shaving soap, insect powder, 2 spool-films, buttons and a brush. 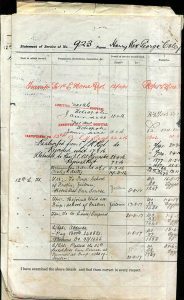 In 1918 he further received a black wallet containing photos, a small calendar, letters, postcards, diary and a leather purse. 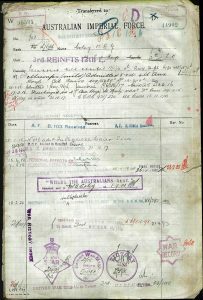 He also received the “Where the Australians Rest” booklet, photographs of his son’s grave, the 1914 and 1915 Star, the British War and Victory medals, and the Memorial Scroll and Memorial Plaque. 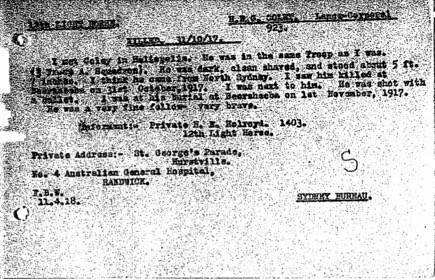 Later, Rex’s father Harry lived at Young, New South Wales, Australia. 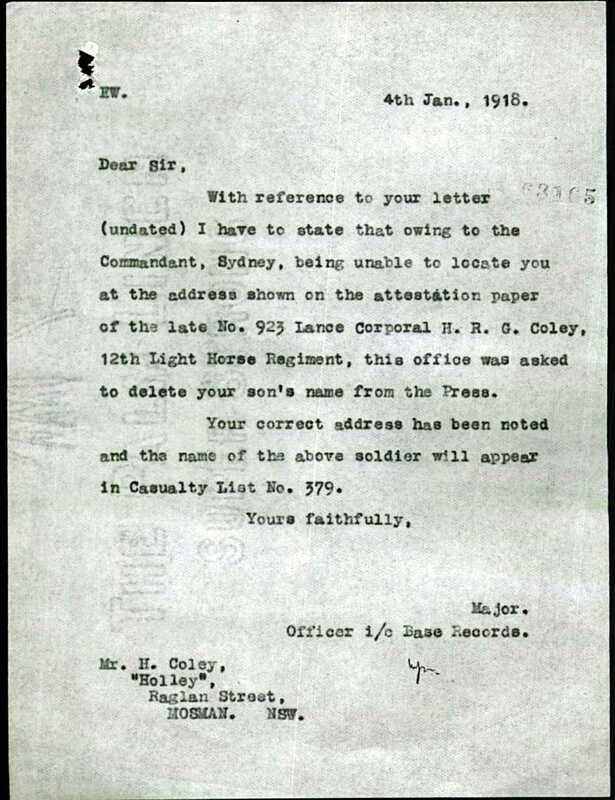 In 1921 he lived at Holly, Raglan Street, Mosman, NSW. 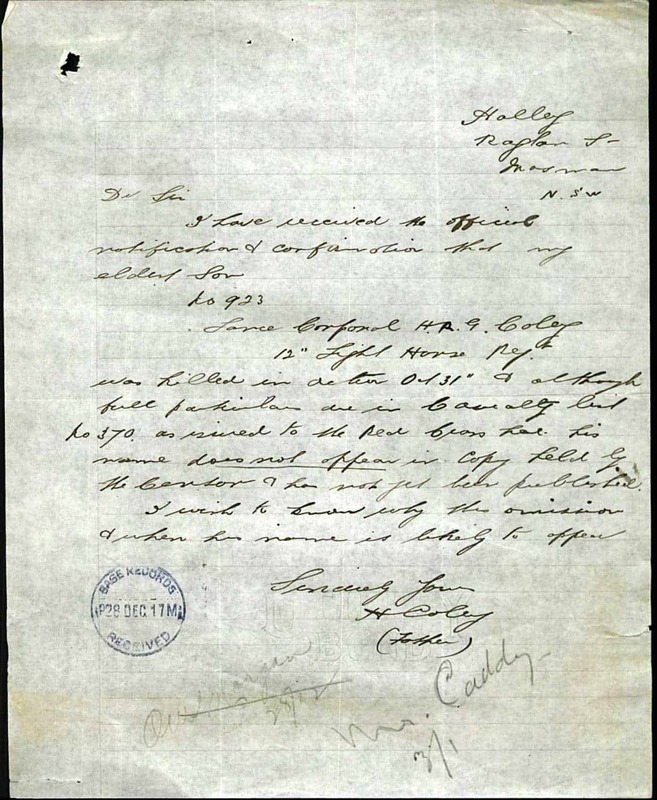 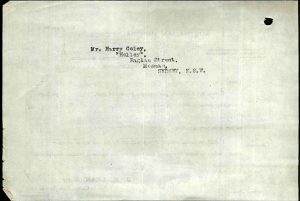 Rex’s father Harry Coley was born on the 22nd of March 1865 in Birmingham, Warwickshire to jeweller George Coley, born about 1837 in Birmingham, Warwickshire and Emma Coley, born about 1834 in Birmingham, Warwickshire. 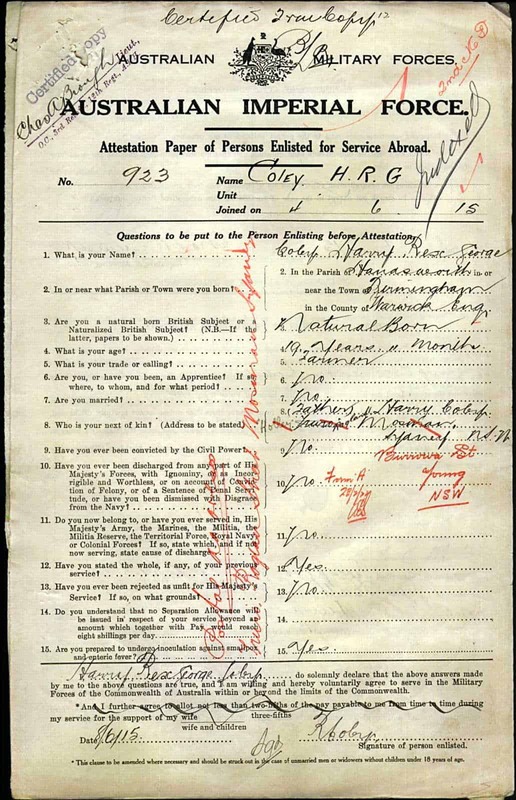 Harry senior was baptised on the 13th of February 1903 at St Mary’s church in Handsworth, Staffordshire. 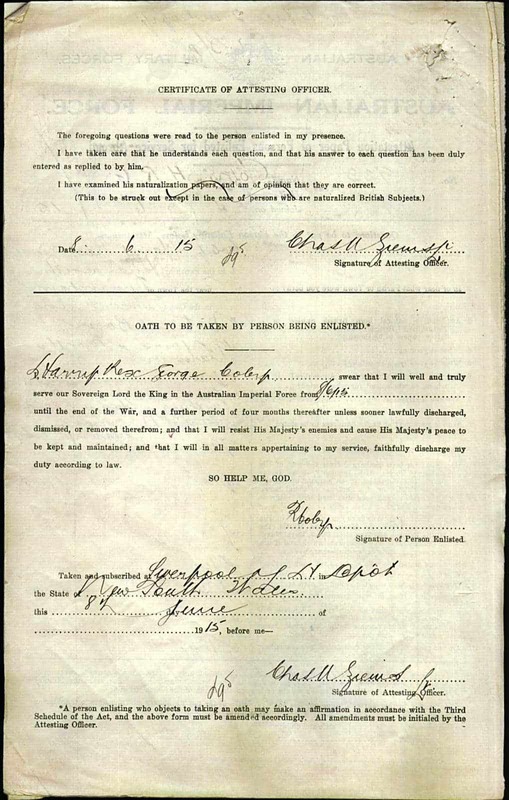 His mother Frances Maria de Fallon was born in the 1st quarter of 1861 in Aston, Warwickshire to police constable James de Fallon, born about 1836 in Ireland and Catherine de Fallon, born about 1836 in Shelton, Shropshire. 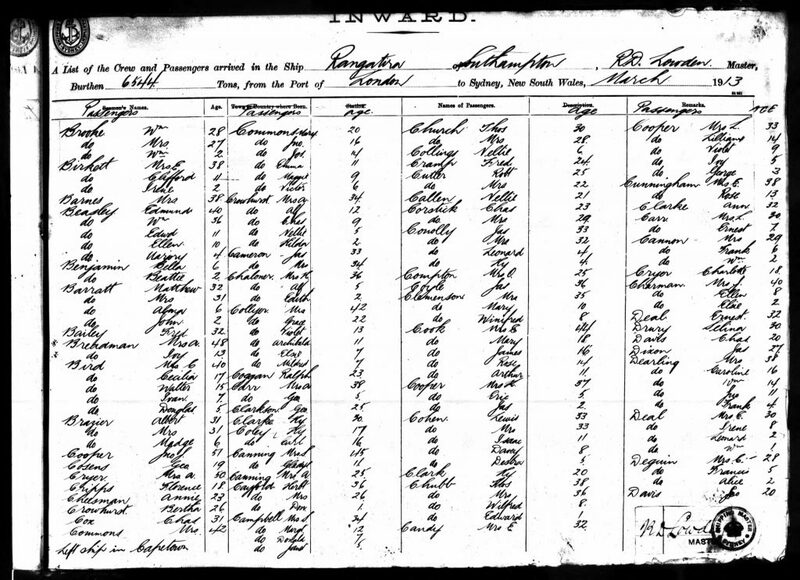 Frances Maria was baptised on the 3rd of February 1861 at St James the Less’ church, Ashted, Warwickshire. 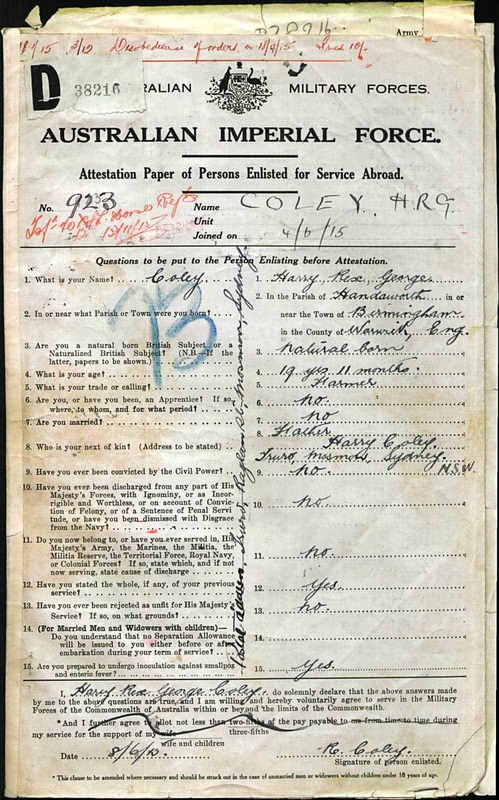 Harry Coley and Frances Maria de Fallon married in the 3rd quarter of 1888 in the Registration District of Aston, Warwickshire.